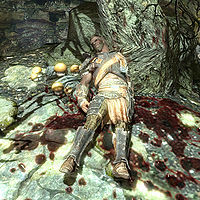 This article is about Adventurers in Skyrim. For the Adventurer added by the Dragonborn expansion, see Adventurer. 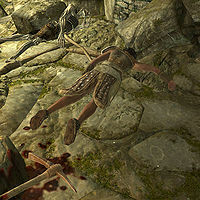 Adventurers can be found in various locations and, with one exception, are all found dead. This Adventurer is alive and can be initially encountered in Harmugstahl fighting an enchanted frostbite spider. After the battle he will sheath his weapon and say: "That was a close one!" When you ask him about the glowing spider he will respond: "I don't know, but this place is full of them. Every one I've encountered has been enchanted or the like. Look, I'm getting out of here. Normally, spiders make my skin crawl, but magic spiders? Blech." He will then head for the entrance, but will add: "Is there anything more revolting than spiders? Too many legs..." When he exits Harmugstahl he disappears from the game. He wears a set of regular leather armor, while his gauntlets and boots are leveled heavy armor of the best possible quality. He wields a randomly determined weapon (up to elven quality at level 22), either a battle axe, a greatsword, or a warhammer. Additionally, he carries a small amount of gold. This Adventurer is the first of an entire group of curious individuals who died inside Folgunthur in an attempt to solve the Forbidden Legend. He is a Breton bandit wizard and can be found immediately after entering the ruin, where he obviously triggered the pressure plate and the corresponding spear trap. He wears fur armor with leveled light boots; there is a 50% chance they will be fur shoes and a 50% chance it will be hide boots (up to level 6), leather boots (up to level 19) or scaled boots (level 19+). 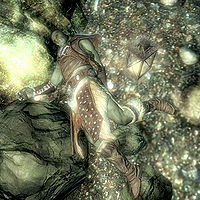 He carries an iron dagger, with a slim chance of carrying one or two potions, a lockpick and/or a small amount of gold. 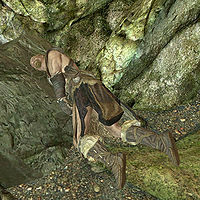 This Adventurer, an Imperial bandit, is found in the very first chamber of Folgunthur, at the foot of the puzzle door. Somehow she succeeded in solving the puzzle, but lost the fight to a draugr when the nearby gate was released. She wears a randomly determined set of light armor; at all levels, there is always a 50% chance she will wear fur shoes, and a set of fur armor, while the other 50% can differ for both shoes and armor; at level 1-5 it can be hide boots and/or hide armor, at level 6-18, it can be leather boots and/or leather armor, and at level 19-28 it can be scaled boots and/or scaled armor or scaled horn armor. Additionally, she has a 50% chance of wearing a set of leveled gauntlets, again randomly determined; it can always be fur bracers but, at level 1-5, there is a 50% chance it can be hide bracers, at level 6-18 it can be leather bracers and at level 19, it can be scaled bracers. Lastly, there is a 20% chance of her carrying a leveled shield, up to elven quality at level 12. Her weapon is random and leveled as well (up to elven quality at level 22) and can be either a mace, a sword or a war axe. She also carries a bit of random loot, food and drink, with a slim chance of a lockpick and/or some gold. 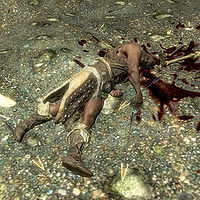 The third dead Adventurer in Folgunthur is a Nord bandit who died in the same chamber as Daynas Valen. His body lies amidst the many oil slicks in the second chamber, one level below Daynas. He wears a randomly determined set of light armor; at all levels, there is always a 50% chance he will wear fur shoes and a set of fur armor, while the other 50% can differ; at level 1-5 it can be hide boots and/or hide armor, at level 6-18, it can be leather boots and/or leather armor, and at level 19-28 it can be scaled boots and/or scaled armor or scaled horn armor. Additionally, he has a 50% chance of wearing a set of leveled gauntlets, again randomly determined; it can always be fur bracers but, at level 1-5, there is a 50% chance it can be hide bracers, at level 6-18 it can be leather bracers and at level 19, it can be scaled bracers. Lastly, there is a 20% chance of her carrying a leveled shield, up to elven quality at level 12. The last Adventurer found in Folgunthur is an Imperial bandit. He can be found close to the body of expedition leader Daynas Valen on the wooden structure with the dragon puzzle keyhole. He wears a random set of light armor; at all levels, there is always a 50% chance he will wear fur shoes and a set of fur armor, while the other 50% can differ; at level 1-5 it can be hide boots and/or hide armor, at level 6-18, it can be leather boots and/or leather armor, and at level 19-28 it can be scaled boots and/or scaled armor or scaled horn armor. Additionally, he has a 50% chance of wearing a set of leveled gauntlets, again randomly determined; it can always be fur bracers but, at level 1-5, there is a 50% chance it can be hide bracers, at level 6-18 it can be leather bracers and at level 19, it can be scaled bracers. Lastly, there is a 20% chance of her carrying a leveled shield, up to elven quality at level 12. His weapon is random and leveled as well (up to elven quality at level 22) and can be either a mace, a sword or a war axe. He also carries a bit of random loot, food and drink, with a slim chance of a lockpick and/or some gold. 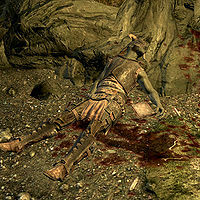 This Adventurer is a Nord bandit whose dead body can be found in the very first chamber of Geirmund's Hall, another victim of the Forbidden Legend. He is clad in randomly determined, leveled, light armor. At all levels, there is a 50% chance he will wear fur shoes and a set of fur armor, while the other 50% can differ; at level 1-5 it can be hide boots and/or hide armor, at level 6-18, it can be leather boots and/or leather armor, and at level 19-28 it can be scaled boots and/or scaled armor or scaled horn armor. Additionally, he has a 50% chance of wearing a set of leveled gauntlets, again randomly determined; it can always be fur bracers but, at level 1-5, there is a 50% chance it can be hide bracers, at level 6-18 it can be leather bracers and at level 19, it can be scaled bracers. He carries a copy of the book Lost Legends, two leveled healing potions and some gold. 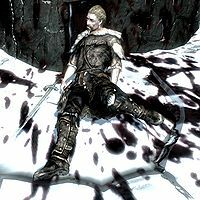 If you initiate the related quest by defeating Sigdis Gauldurson in Geirmund's Hall, The Adventurer's copy of the Lost Legends book will become quest-related and a map marker will point you to the dead body. This Adventurer is an Imperial bandit who died in the first chamber of Reachwater Rock while trying to figure out the mystery of the Forbidden Legend. 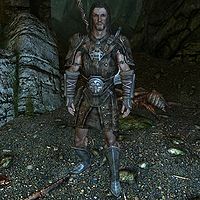 He wears leveled heavy armor; up to level 6 he will wear iron armor or banded iron armor and iron boots. Up to level 18 he wears steel armor and steel cuffed boots or steel shin boots. From level 18 onward, he wears steel plate armor and steel plate boots. Additionally, there is a 50% chance he will wear gauntlets and/or a helmet, also leveled; up to level 6 they can be iron gauntlets and/or an iron helmet. 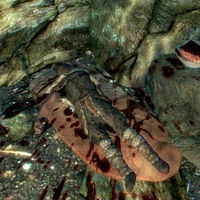 Up to level 18, there are two variations of each item, specifically steel Nordic gauntlets or steel imperial gauntlets for the hands, and a steel helmet or a steel horned helmet. From level 18 onward, he can wear steel plate gauntlets and/or a Steel Plate Helmet. His weapon is random and leveled as well (up to elven quality at level 22) and can be either a mace, a sword or a war axe. He always carries three health potions and some random loot. He also has a slim chance of carrying a lockpick and/or some gold. Lastly, he carries the book Lost Legends. If you initiate the related quest by reading the Ancient Edict on the pedestal next to him, his copy of the book will become quest-related and a map marker will point you to the Adventurer. This Adventurer is an Imperial bandit who can be found dead in an alcove immediately after entering Chillwind Depths. He is the first of two adventurers in the cave and is possibly the author of the Adventurer's Journal, a note found in an abandoned camp outside Chillwind Depths. He is clad in randomly determined, leveled, light armor. At all levels, there is a 50% chance he will wear fur shoes and a set of fur armor, while the other 50% can differ; at level 1-5 it can be hide boots and/or hide armor, at level 6-18, it can be leather boots and/or leather armor, and at level 19-28 it can be scaled boots and/or scaled armor or scaled horn armor. Additionally, he has a 50% chance of wearing a set of leveled gauntlets, again randomly determined; it can always be fur bracers but, at level 1-5, there is a 50% chance it can be hide bracers, at level 6-18 it can be leather bracers and at level 19, it can be scaled bracers. 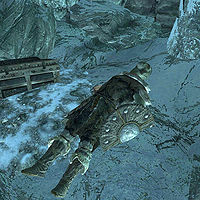 The second dead Adventurer in Chillwind Depths is an Orc bandit who lost the fight to the many residing frostbite spiders in the central chamber of the cave. He wears randomly determined, leveled, light armor. At all levels, there is a 50% chance he will wear fur shoes and a set of fur armor, while the other 50% can differ; at level 1-5 it can be hide boots and/or hide armor, at level 6-18, it can be leather boots and/or leather armor, and at level 19-28 it can be scaled boots and/or scaled armor or scaled horn armor. Additionally, he has a 50% chance of wearing a set of leveled gauntlets, again randomly determined; it can always be fur bracers but, at level 1-5, there is a 50% chance it can be hide bracers, at level 6-18 it can be leather bracers and at level 19, it can be scaled bracers. His weapon is random and leveled as well (up to elven quality at level 22) and can be either a battleaxe, a greatsword or a warhammer. He carries a leveled potion of stamina, and a bit of random loot, food and drink, with a slim chance of a lockpick and/or some gold. This Adventurer is an Orc bandit who can be found in the very first chamber of Deepwood Redoubt. 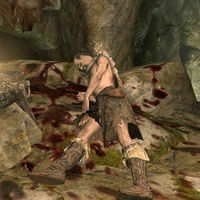 His dead body can be found hidden on a rock formation in the northern part of the chamber, lying next to a locked chest and a potion of healing. He wears a randomly determined set of light armor; at all levels, there is always a 50% chance he will wear a pair of fur shoes, and a set of fur armor, while the other 50% can differ for both shoes and armor; at level 1-5 it can be hide boots and/or hide armor, at level 6-18, it can be leather boots and/or leather armor, and at level 19-28 it can be scaled boots and/or scaled armor or scaled horn armor. He also carries a leveled light shield, up to elven quality at level 15 and has a 50% chance of wearing a set of leveled bracers, again randomly determined; it can always be fur bracers but, at level 1-5, there is a 50% chance it can be hide bracers, at level 6-18 it can be leather bracers and at level 19, it can be scaled bracers. His weapon is random and leveled as well (up to elven quality at level 22) and can be either a mace, a sword or a war axe. He carries a bit of random loot, food and drink and some gold. This Adventurer is an Orc bandit who died in the first chamber of Rebel's Cairn in his attempt to solve the mystery behind The Legend of Red Eagle. He is lying behind a pillar in the center of the chamber, still clutching the book in his hand. 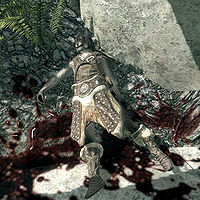 He wears leveled heavy armor; up to level 6 he will wear iron armor with iron boots and an iron helmet. Up to level 18 he wears steel armor, steel cuffed boots and either a steel helmet or a steel horned helmet. From level 18 onward, he wears steel plate armor with steel plate boots and a steel plate helmet. Additionally, there is a 50% chance he will wear gauntlets, also leveled; up to level 6 they can be iron gauntlets, up to level 15, they can be either steel Nordic gauntlets or steel imperial gauntlets. From level 15 onward, he can wear a set of steel plate gauntlets. His weapon is random and leveled as well (up to elven quality at level 22) and can be either a battleaxe, a greatsword or a warhammer. He carries some random bandit loot and has a slim chance of carrying a lockpick and/or some gold. 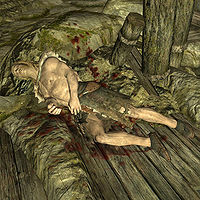 This Adventurer is a Nord bandit who can be found at the Skyborn Altar where he obviously lost the fight against the residing dragon. He is leaned against the word wall where you can learn one of the words for the Frost Breath shout. Next to his body lies his iron sword and iron shield. He carries a two healing potions and a leveled amount of gold. 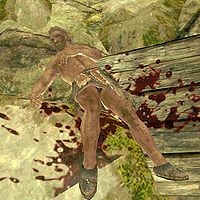 This Adventurer is a Khajiit bandit who died outside Mzulft; his dead body can be found under a small arch with a roof. He wears studded armor and hide boots and his weapon of choice is randomly determined and leveled (up to elven quality at level 22) and can be either a mace, a sword or a war axe. He carries a bit of gold and has a chance of carrying some random loot, food, drink and jewelry. If you have claimed the 'Glowing Chrystal Shard' from the Dwarven Storeroom, without having read the book The Aetherium Wars, he will also carry a copy of said book that will send you to Arkngthamz for the quest Lost to the Ages. 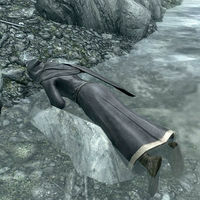 This Adventurer is a Breton conjurer lying outside Deep Folk Crossing, lying half in the river. She wears hooded blue robes with a pair of boots. She carries a leveled dagger (up to glass quality at level 18) and a chance of some random wizard loot, like soul gems, spell tomes, potions and/or ingredients. She always carries a small amount of gold. Despite her condition, she knows a few spells as well, specifically Lesser Ward, Flames, Oakflesh and Conjure Familiar. If you have claimed the 'Glowing Chrystal Shard' from the podium south of Deep Folk Crossing, without having read the book The Aetherium Wars, she will also carry a copy of said book that will send you to Arkngthamz for the quest Lost to the Ages. This Adventurer is an Imperial bandit who can be found inside Arkngthamz, next to an arch in the middle of a room, with a skeleton and a few Dwarven arrows nearby. He carries a leveled bow and arrows (up to elven quality at level 20) and an additional 22 iron arrows. He also carries a bit of random loot, food and drink and/or jewelry. Most importantly, he carries a Scrap of Paper with an important clue on how to solve the tonal lock that killed him. This page was last modified on 26 January 2016, at 22:17.